Do you have any of those recipes that your family has made for as long as you can remember? For my family, this kitchen sink granola is one of those. A few of the first few things I learned how to make and made on a regular basis were whole-wheat blueberry muffins, just about any kind of pasta (although baked ziti and lasagna were my favorites), whole-wheat banana bread, and this granola recipe. 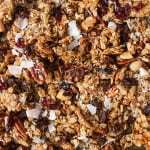 I think the recipe originally came from a family friend, and over the years, we’ve customized it with my family’s favorite mix-ins and figured out a couple of tricks to help the granola stay in big, crunchy clusters. The base of the granola has oats, honey, coconut oil, cinnamon, and nuts. For the nuts, I’ll use a combination of whatever we have on hand, which usually includes almonds, walnuts, pecans, and Brazil nuts. 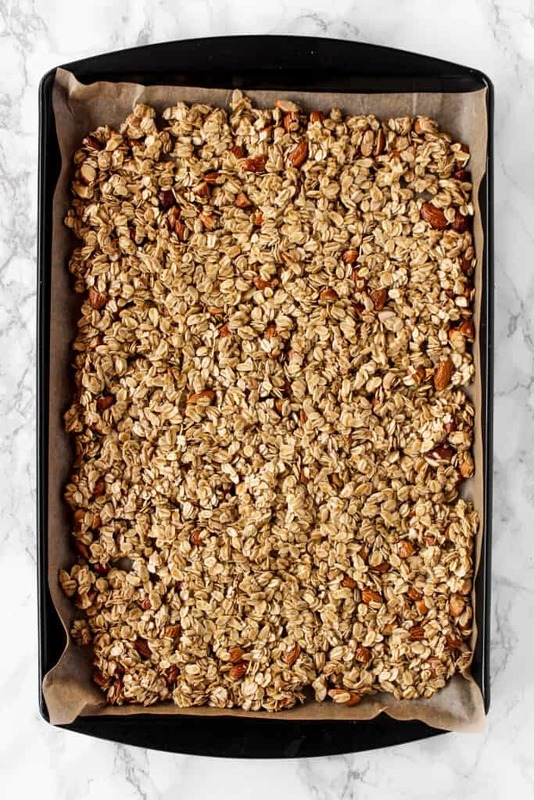 Mix those together, spread the oat mixture on a parchment-lined baking sheet for easy clean-up, and pop it in the oven. To help the granola cluster together, I use one little trick. when the granola comes out of the oven, I press it down with the back of a spatula to help it form clusters, and then I let it completely cool before I break it up. 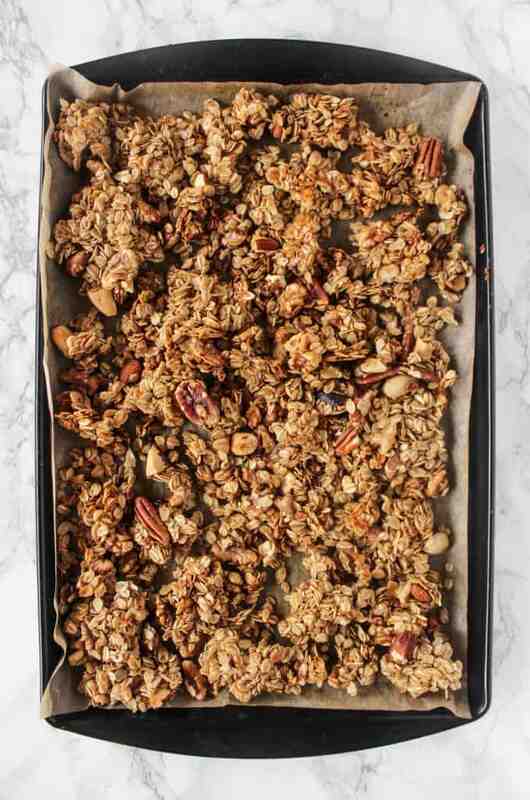 Once the granola is completely cooled, it’s time to add all of the extra yummy mix-ins! The best thing about kitchen sink granola is that you can toss in just about any type of nuts and mix-ins you want. My favorites are raisins, dried cranberries, and recently, unsweetened coconut chips. You can also add dark or semisweet chocolate chips and around the holidays, I’ll sometimes add white chocolate chips. I usually make a double batch so there’s some for our family and extra to give away. 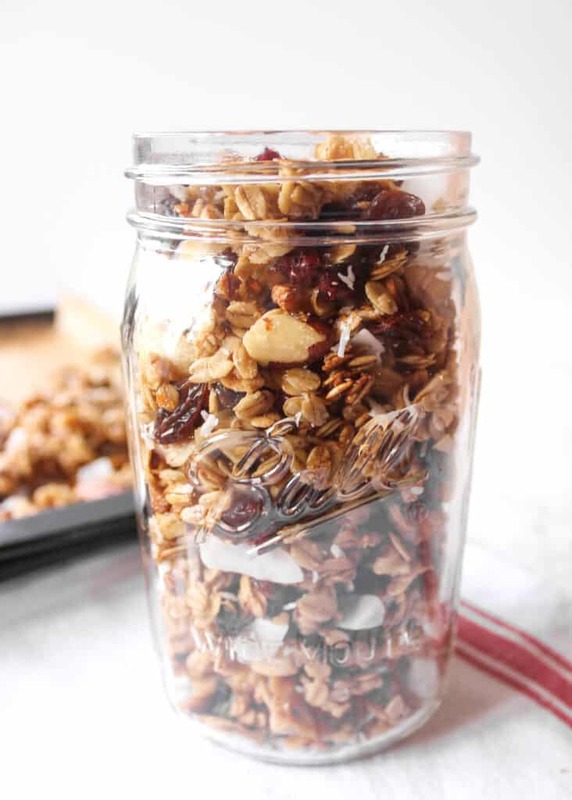 I love giving kitchen sink granola as a gift around the holidays to friends in a clear bag or mason jar with a cute, festive ribbon. In fact, I put a big bag in my snack food-loving grandpa’s stocking just about every Christmas! I’ll warn you that this granola is seriously addictive and hard to stop eating, but the good thing is that it’s made with all real, natural ingredients and no refined sugar so you can feel good about eating it…until the 9th or 10th handful, at least. But I’m sure you’re much better at portion control than I am. 😉 If you try this coconut oil granola recipe, feel free to let me know in a comment or take a picture and tag me @livbane on Instagram. Hope you enjoy! In a medium bowl, combine oats, cinnamon, and salt. Add oil and honey to the oats, measuring out oil first so honey doesn't stick to measuring cup. Add nuts and stir until oats are coated with the liquid mixture. Line a baking sheet with parchment paper and pour oat and nut mixture onto the baking sheet. Bake at 325 degrees for 15 to 20 minutes, until starting to lightly brown, stirring once during baking. Remove from oven and immediately press down with a spatula to help clusters form. 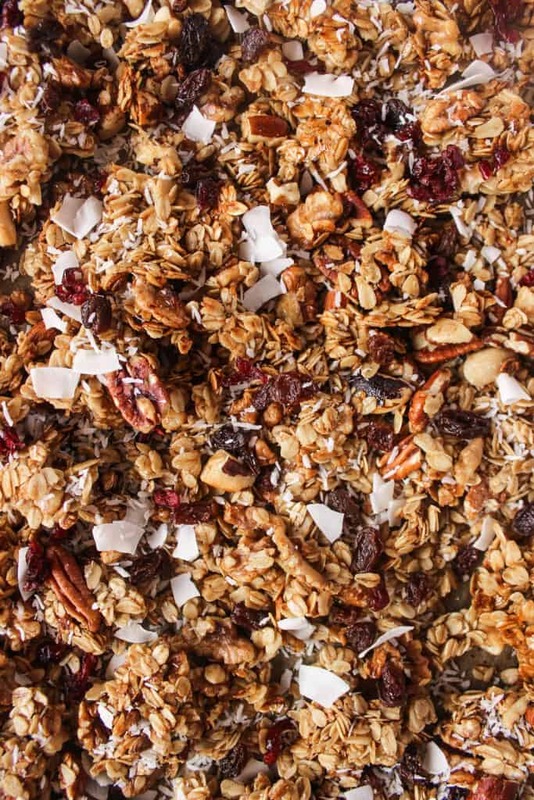 Let granola cool completely and then add dried fruit, coconut chips or flakes, and/or chocolate chips. Break into large clusters. Store in airtight container for up to 2 weeks or freeze for up to several months. Do you keep making any recipes that your family’s made for years? What are some of the first things you learned how to cook? I love making granola! It’s my boyfriends favorite so I love surprising him with a batch of homemade granola! I can’t wait to try your method out he is a huge fan of big chunk granola! This what we enjoy on Fridays, but with the savory ingredients in our fridge! We end up making big sandwiches and I love it! It’s the chance to concoct new flavor combos, and I love it. 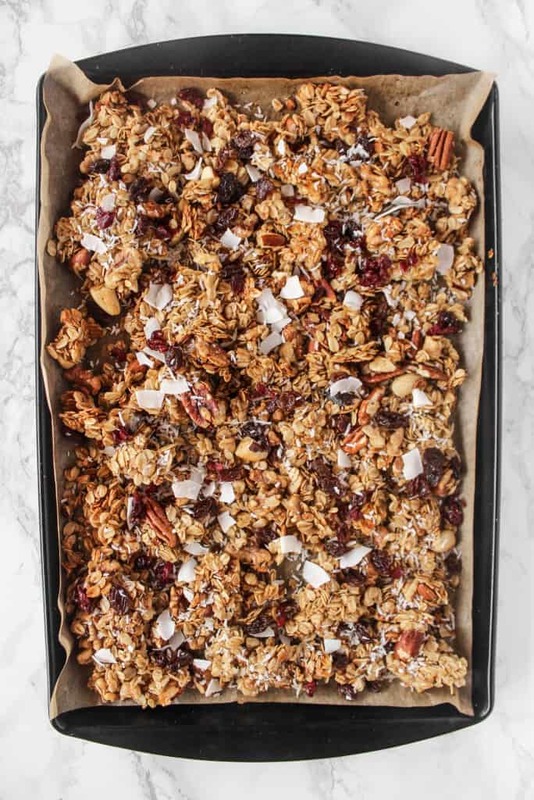 I’m totally into this idea of throwing it into granola just like trail mix! I love your chunky granola tips! Noah this looks so crispy & delicious! I love when granola is super chunky! I am horrible at portion control with granola- I’m a 9 or 10 handful gal like you lol! I love big dark chocolate chunks and dried cherries in my granola! Dark chocolate chunks are my weakness! I think this is my third (or maybe fourth…?) time making this granola! LOVE how it’s guilt free and not chock full of sugar. Thanks for another great recipe Liv! 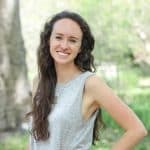 Wow, I”m so happy to hear that, Sophie! So glad you’re enjoying the granola! Looks great! Going to try very soon! Question: on some of the comments they say they have it for breakfast…do you just “handfuls” or have it like a cereal breakfast with milk in a bowl? Just wondering???? I like to eat it by the handful or sprinkle it on my yogurt versus eating it as cereal! We love granola. I will try to make this recipe.